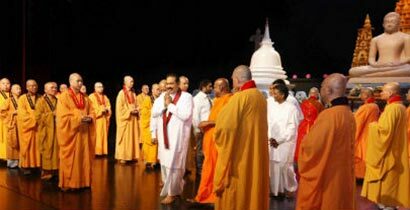 A blessings ceremony by a world Sangha congregation for global peace to mark the 2600th anniversary of the Buddha’s Enlightenment, began at the Nelum Pokuna(Lotus Pond) theatre in Colombo yesterday under the patronage of President Mahinda Rajapaksa. Over 500 members of Maha Sangha from 30 countries joined over 1,000 members of Maha Sangha from Sri Lanka at the inuagural ceremony yesterday. It is organized by the World Buddhist Sangha Council with its Sri Lankan branch spearheading efforts in hosting the event. Pirith chanting was conducted in Theravada, Mahayana, Vajrayana and Korean traditions to invoke blessings for World Peace and unity. Prior to this Buddha Pooja was conducted with 20 Monks, 20 lay persons and 20 drummers taking part.Several devotional traditional dances too were conducted on stage where the magnificent background settings included a Buddha statue, a stupa and a replica of Buddhagaya. Later as the Maha Sangha chanted pirith President Rajapaksa made offerings at the Buddha statue. Most Ven. Liao Chung Maha Thera, President – World Buddhist Sangha Council praising Sri Lanka for organising the ceremony said “ Sri Lankan Buddhism has made magnificent achievements in the past as well as in the present. It is not only an old Buddhist country but the pioneer in promoting the Buddhist internationalization in the modern day” “May the very success of this congregation bring about world peace, humanity’s happiness, the prosperity of Sri Lanka, and the good health of the President Rajapaksa, members of the Maha Sangha and all devotees”, the Thera added. Ven. Prof. Bellanwila Wimalaratana Anunayaka Maha Thera who headed the Organizing committee in an ‘anusasana’ said that the World Buddhist Council has brought the global Buddhist community under one flag. The Thera welcomed the joining of world Buddhist community for world peace and unity and added that this happening at the 2600 Sri sambuddhathwa Jayanthi had added significance. Religious ceremonies as a part of the ceremony will be held in various parts of the country until Friday. Maha Sangha from all sect’s in Sri Lanka will join the visiting Maha Sangha at these events. Yesterdays ceremony was also attended by Ministers, Ambassadors, High Commissioners, heads of various Buddhist Organizations and devotees. Some of the countries which are participating are Thailand, Myanmar, Nepal, Singapore, Malaysia, Bangladesh, India, Taiwan, Hongkon, Macau, Phillipines, Australia, New Zealand, Canada, US, UK, France, Germany, Sweden, Indonesia and China. What we realy need today is “Actions” & not the blessings.! which is No one Doing at all today..! yes Amden, Buddhism is the dominant religion in our land. It should actively participate in all national affairs including the threats of the tamil terrors. It is only Buddhism that can eradicate tamil terror from our land. Its proponents are not active enough to deal with all the threats posed by tamil terrors. It might be a Buddhist one Rise to the occasion soon…!